Nothing like a brawl and some yuks between bros.
Once 1990 hit, the beat-em-up genre expanded its horizons. 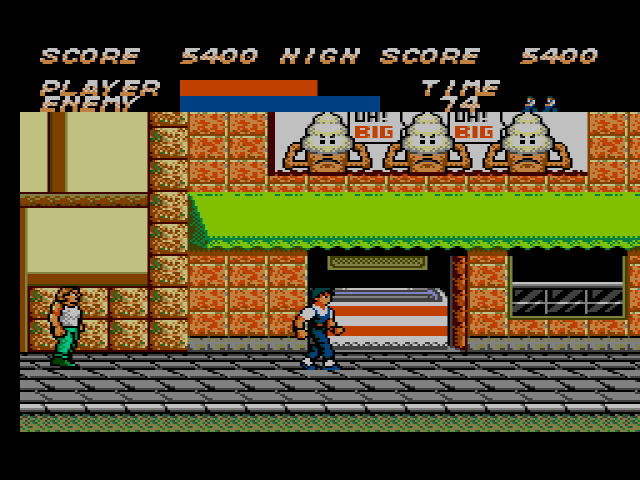 Double Dragon II, River City Ransom, and Teenage Mutant Ninja Turtles II: The Arcade Game provided cooperative battling with a friend, move lists as opposed to a simple kick and punch, and in River City Ransom‘s case, light RPG elements like leveling up your abilities via reading books. 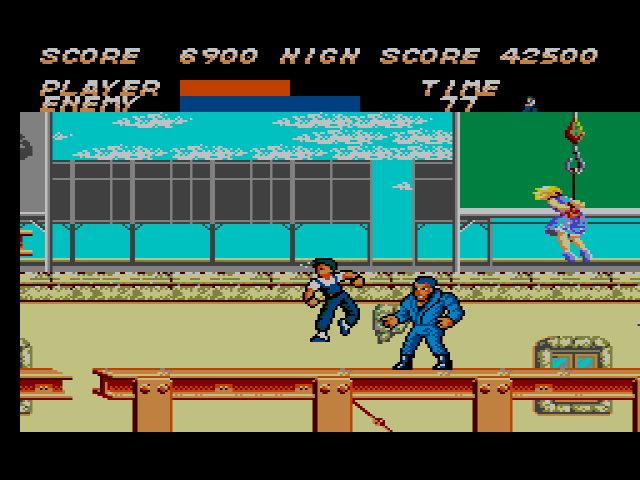 Vigilante – originally released in 1988 for arcade – is part of the old guard, a straightforward hit-the-dudes-that-run-at-you excursion. And while this beat-em-up style isn’t necessarily bad (see: Kung Fu, Vigilante‘s spiritual predecessor), Vigilante‘s clumsy controls, overly aggressive enemies, and monotonous gameplay highlights the genre’s weaknesses. The story is typical beat-em-up fare. 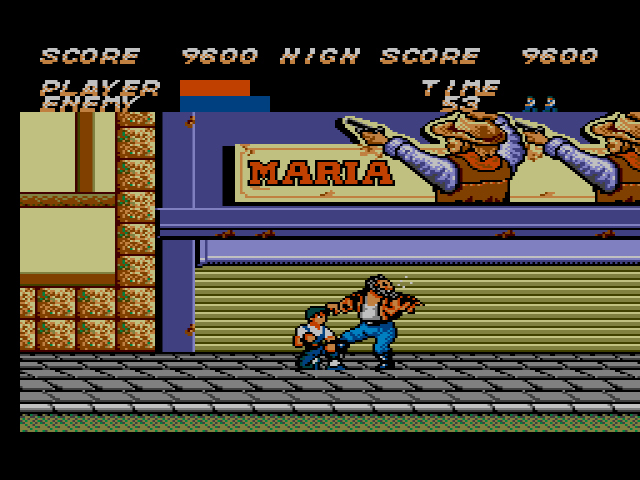 Vigilante’s main squeeze, Maria (Madonna in the arcade version because 1988) has been kidnapped by the inner-city gang, the Rogues. 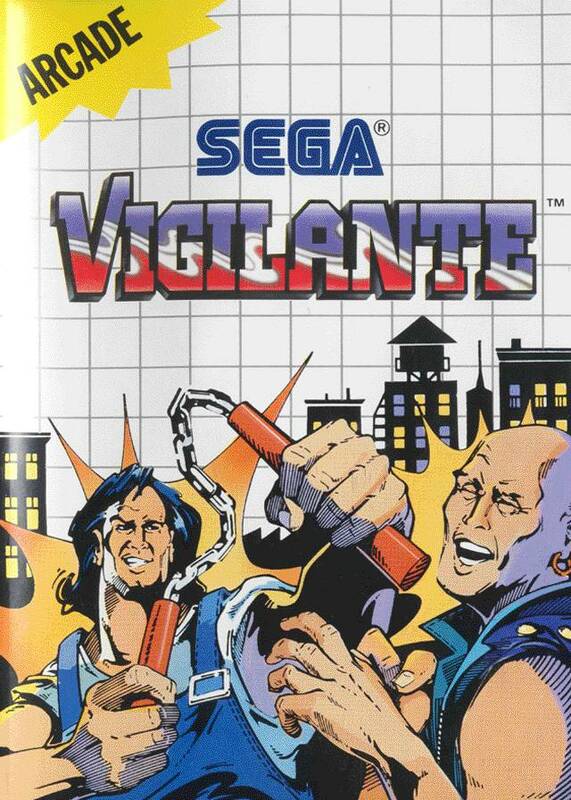 Since your name is, in fact, Vigilante, you know your role: beat the crap out of anyone that runs at you in five seedy inner-city environments. You have a kick, a punch, a jump kick/punch, and nunchucks available on the ground in select areas for your beating pleasure. Get the nunchuks when you find them. Their attack range and overall power is far greater than your pitiful limbs. The Rogues have a limitless supply of thugs and are not put off by the failures of their fellow gang members. Regardless of if you walk forward, backwards, or stand perfectly still, you will be forced to fight two members of the gang at all times, and often from both directions. Each type of enemy has a different attack. Club Thug walks up to you, pauses, then clubs you. Rogue Rider rides his motorcycle into you. And Choke Hold runs towards you and chokes you. The bosses – Harly Hog, Macehead the Horrible, and Giant Defiant – all have unique attacks, “fancy footwork,” if you will. But get the nunchucks on them, attack their legs, and they’ll go down without much of a fight. Choke Hold is the worst enemy in the game, and that includes the bosses. He might be the quickest type to take down – one hit will knock him off the screen every time – but he’s also the most abundant enemy and his choke will rapidly drain your life. The only way to shake him off once he’s on you is by pressing the D-pad left and right repeatedly. Keeping him away from you is not as easy as it sounds, either. Your punches don’t reach far beyond your body and, unless you’ve figured out the proper timing for your kicks, they can take too long to execute (more on this below). This means that you have to attack Choke Hold at just the right time/distance for him to go down. Otherwise, he’ll grab on to you and you won’t be able to attack. If you see a Choke Hold coming for you along with another enemy, always attack them first. If you don’t, Choke Hold will slow you down, drain your life, and allow stronger enemies to beat up on you. Ice cream shops were more eccentric in the ’80s. 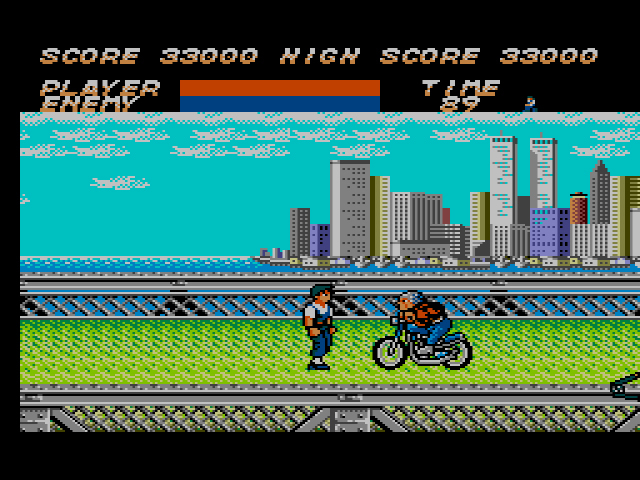 As you progress further into Vigilante, your annoyance will turn from the numerous Choke Holds towards the controls. The game seems to read your command inputs about a millisecond late. Kicks, jumps, and jump attacks are the worst offenders. All three of these moves are slow to respond, while the latter two are compounded by awkward inputs (jump is button 1 and 2 together, while jump attacks are Button 1+2+Up/Down). Bottom line: use the nunchucks or punch whenever possible. Jump only if you have to. I think it’s safe to say that smarts. While Vigilante only has five short stages and the bosses are cake compared to the waves of thug templates, the game isn’t a rewarding one to suffer through. 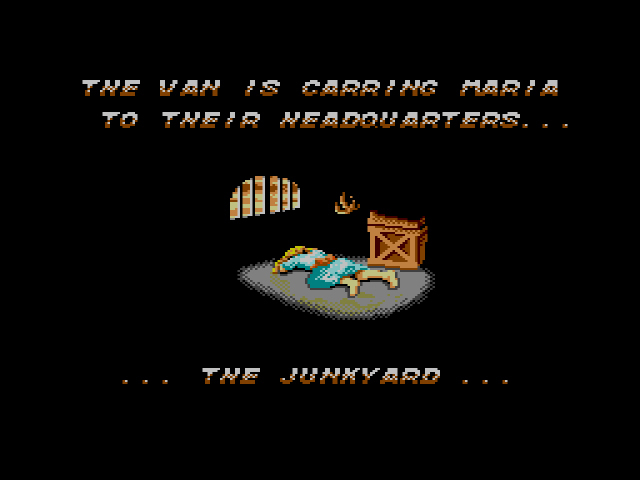 When your one and only task – beating ’em up – is made more difficult than necessary by obnoxious enemy types and laggy controls, you have to wonder why you went into the vigilante business at all. And if Madonna -er, Maria is worth the trouble. Yeah I think this review is pretty accurate. I remember borrowing it from a friend and finishing it in one afternoon. Sure glad I didn’t spend my allowance on it. Never played the arcade version but not sure its any better. Ah, the 80s. Bob Seger was writing songs for truck commercials, the president was Jean Claude Van Damme, and you couldn’t walk down the street without having to put hoards of thugs in the hospital. What a time to be alive! Haha Van Damme … The Muscles from Brussels! A guy from Brussels president? Say what? That Jihadist-infested “hellhole” (Trump’s description of my hometown, see: http://www.nytimes.com/2016/01/28/world/europe/trump-finds-new-city-to-insult-brussels.html?_r=0)! So you’re actually saying The president is a foreign born Muslim? The birthers were right after all! The Republican Party – and especially it’s frontrunner – resemble an eighties Beat-em-up game!!! Lol, Trump pretty much is the boss of an 80s beat em up. Like he’d show up at the end and tear his shirt open, revealing bulging muscles and he’d take like 50 hits to finish off. His best attack is his hair throw that takes off half your life bar. 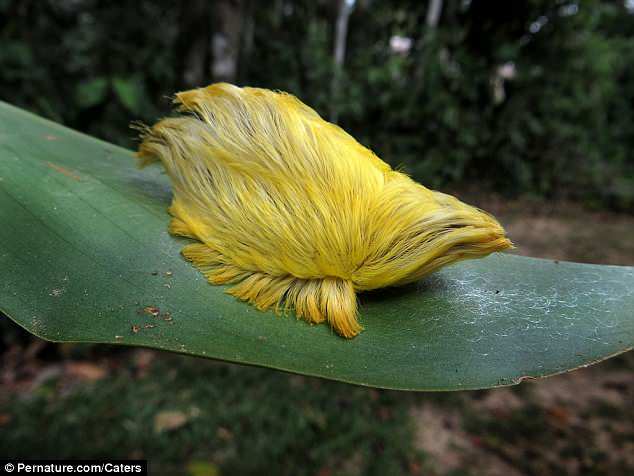 He would be one of them fake bosses though … After finally killing him, his hair would turn into a supersized version of the very poisenous “Flannel Moth caterpillar” and reveal Itself as the true puppetmaster! While this first fight was set against the backdrop of the White House, his hair would now crawl into a hidden hole. Obviously you’de go after him and end up in an elevator that takes you to the top floor of “Trump Tower” After hitting the hair a couple of times, the office windows would break and he would attract lightning bolts to electricially charge his attacks. It will be damn mighty apocalyptic!!! Madonna in 1988 was less “Express Yourself” and more “Who’s That Girl” if we’re going for accuracy. So, basically, the game is utterly forgettable. No worries, Pieter! You can still comment on Tennis Ace, if you like. I was surprised to find that it was a good game, given the Master System’s tennis game track record.